Lenard Paul Walker was born 75 years ago in a little town in northeast Colorado. He had a pony and a team of work horses he followed in the field. He has been involved with horses ever since, but graduated to a tractor before he was old enough for school. His love was equipment, and he continued to operate ever larger pieces in the Air Force and through to retirement in 1995. To this day, he enjoys operating his backhoe with “Poochy” beside him. Lenard started roping in the PRCA when he came back from Okanawa, and got out of the Air Force. All of his free time was spent in an arena, first in Tucson, where many of you met and roped with him, then on to Flagstaff, where he held round robins and ropings, and now in Casa Grande, where neighbors and friends come to perfect their skills, learn how to rope, or just have fun. He has taught many young people and helped anyone who wanted to practice. 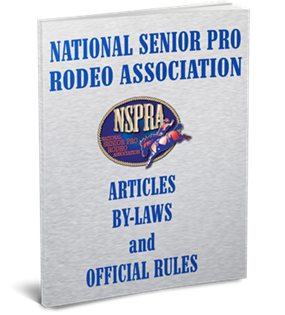 Since 1995, Lenard has rodeoed with the NSPRA fulltime, joining when it was NOTRA. Throughout these years, he has helped in any way he might be needed, from fixing brakes to building a workable arena. Due to Lenard’s efforts, the American flag has never failed to fly at any NSPRA rodeo, no matter the conditions or the number of spectators. He is a living example of a proud American vet and a cowboy through and through.